The Batman by-election in Melbourne on 17 March is a battle between The Greens’ Alex Bhathal and the ALP’s Ged Kearney. A win for Bhathal would give The Greens a second seat in the House of Representatives. Batman is one of the 25 seats that Greens leader Richard Di Natale sees as the basis for The Greens’ long-term hope of holding some balance of parliamentary power. There will be national attention for that reason. Sitting ALP MP David Feeney resigned because of the dual citizenship fiasco. But he was always unpopular even with Labor voters. He was a right-wing factional party power-broker, whose undeclared and unlived-in negatively-geared $2.3 million property in the electorate was an embarrassment and a drag on the Labor vote. One question that will be centre-stage is refugees. In her election video, Bhathal says, “We will close the camps, we will bring the refugees here”. Bhathal also told her 300-strong campaign launch that the question of refugees was the prime reason for her running in the seat again. As ACTU President Kearney has spoken at Refugee Action Collective forums and long advocated for refugees. She played an important role in developing the ACTU’s pro-refugee policy which, “calls for the detention centres on Manus Island, Nauru, and any other offshore detention centres to be closed”. That’s a pity. If Kearney would publicly campaign as a Labor candidate committed to the demand to “Bring Them Here”, it would be a major boost for the movement and dramatically ramp up the pressure on Shorten and the Labor Party to end their bi-partisan support of Liberal policy. Nonetheless ALP refugee policy is a reality that can be changed. Sixty-eight per cent of Labor voters across Australia want the refugees on Manus and Nauru brought to Australia. Labor voters can vote 1 Greens, 2 Labor knowing there is no chance of a Liberal winning the seat. The Refugee Action Collective has called a “Bring Them Here” rally in Batman for Saturday 10 March to mobilise refugee supporters in the electorate and help build an even bigger rally for the Melbourne-wide Palm Sunday refugee rally on 25 March. The Liberal vote in Batman is derisory and the state party has announced that it won’t field a candidate. On the face of it, this makes a Bhathal win more likely. The right-wing Victorian state president Michael Kroger said that the Liberals would not be “a vote-channelling machine for Labor”—meaning this time around they are going to favour The Greens winning over Labor. This is a challenge for Bhathal. Electoral opportunism has sometimes seen The Greens attempt to win seats by wooing the Liberal vote. Bhathal needs to make it clear that voting Greens is a vote for a candidate who will do everything she can to get rid of the Turnbull government. This is also the best way for Bhathal to win the left Labor vote. No doubt Kearney can expect to get a higher vote than Feeney—whose personal vote was about zero. But Batman is an electorate that is split in two—the northern half votes Labor, the southern part votes Green. The nurses union has backed Kearney (a former nurses’ leader) as has ACTU Secretary Sally McManus. Labor is already out campaigning on penalty rates and school funding. The Greens say they will tackle inequality. But their pledges need to go beyond their existing modest promises—to protect renters, tackle housing inequality, and to ban corporate political donations. The Greens could campaign in support of the striking Australian Paper workers in Preston to show their opposition to Turnbull’s anti-union laws. Bhathal is also making a big issue of opposing the Adani coal mine—something Labor has opportunistically moved to neutralise by making anti-Adani noises, although Shorten stops short of outright opposition. Bhathal is also yet to make it clear where she stands in regard to Di Natale’s push to move The Greens to the “pragmatic” centre. Solidarity is calling for a vote for Bhathal, with second preference to Labor. A win for Bhathal would put further pressure on the ALP to dump its cruel refugee policies. If Bhathal wins, it would help kill off the myth that pro-refugee policies are electoral poison. This election won’t settle the question of Manus and Nauru, and it won’t get rid of Turnbull. 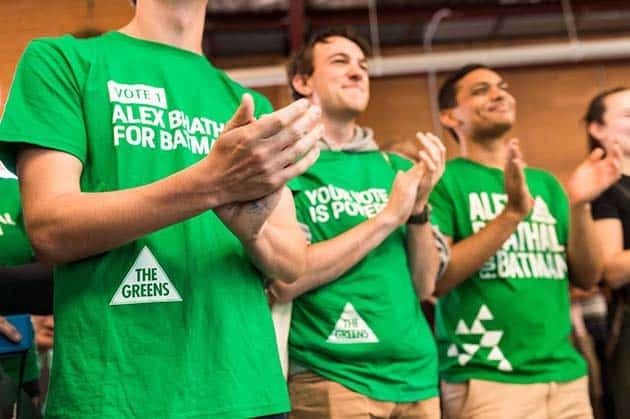 But a win for The Greens can be the basis for building stronger grassroots refugee and union movements that can beat Turnbull and the system he represents.